Geek Couples: Vastra and Jenny | Warped Factor - Words in the Key of Geek. Love famously conquers all. It takes its time about it, and sometimes it takes longer than the lifespan of lovers will allow, but it gets there. Love is, practically by definition, unlimited, but human beings are generally slow in getting to grips with this idea – except in the realm of science fiction and fantasy. Sixty years ago in Britain, it was illegal for gay lovers to be publically out, meaning their love was devalued by society. In many places in the world, including some that claim to be civilised, it still is. But the acceptance of society can never shackle love – it can pull it to pieces sometimes, but it won’t stop people being people and loving who they love. Cross-species love in the real world remains a crime to this day because humanity has yet to find a species sufficiently like itself, that can for instance be said to give consent, and the likelihood is that in a future in which that happens, there will still be some rocky road ahead for cross-species lovers before any majority of human beings sees such relationships as ‘just love,’ because we seem almost privilege-bound to be stupid about it – witness the struggle for the equality of sexualities, transgender rights and more. Meanwhile in science fiction and fantasy, writers have always taken the opportunity to explore relationships between species, to the point where it’s become, for instance, an almost exhausted trope of the Star Trek franchise (thank you, Captain Kirk!). Meet Madame Vastra and Jenny Flint, a married lesbian Silurian-Human couple of badasses, who for reasons living in Victorian England, necessitating the fiction that they are a human lady with a skin condition and her housemaid. As closets go, they don’t come much bigger or more sturdy than that. It would be tempting to ask why they don’t go and live somewhere more enlightened. The point is that while they are both entirely comfortable with technology from far further in time than the 19th century, that period is home to both of them – Jenny, we know, was turned away by her family for her sexuality; while the story of Queen Victoria declaring sexual relations between women ‘impossible’ and so not banning them along with gay male relationships is actually apocryphal, lesbianism had yet to enjoy its vogue among literary and intellectual heavyweights by 1888 (indeed, the word lesbian wasn’t generally used or widely introduced until two years before Victoria’s death), so a young, relatively poor woman like Jenny would have had to have chosen her confidantes with an extremity of care. Indeed, we’re told Vastra and the Doctor both saved Jenny’s life when they first met, as she was being attacked by a mob. Vastra took her in genuinely as a housemaid, and love blossomed between them. So what brings these two species-crossed lovers together, and what keeps them together in a world that thinks ill of their relationship, or would do if they revealed it? For Jenny, the attraction is probably more straightforward – initially, she is likely to have hero-worshipped her rescuer, the tall, strong woman who saved her from the mob and gave her a place to be. 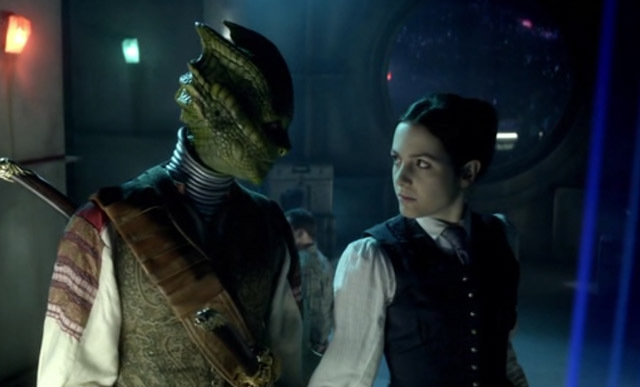 As the reality of Vastra’s life became clearer to her, Jenny is the kind of character who would embrace the spirit of the new and the exotic, but perhaps more than that, Vastra gives her a place where, at least between themselves, she doesn’t need to hide who she is, what she feels or how those feelings find expression. Vastra relieves her from that minefield of worry about revealing herself, and lets Jenny be Jenny, perhaps for the first time in her life. For Vastra, much of the time, the attraction seems, to use an entirely wrong word, ‘paternalistic,’ showing a young lover a wide open new world, of technology, adventure and combat – but look a little deeper and it’s much more than that. In Deep Breath, Vastra’s quite playful in her physical appreciation of Jenny, and in The Name of The Doctor, when it looks as though Jenny’s been killed, the effect on Vastra is devastating, making her beg and scream at the universe (in the form of a handy Sontaran) to bring her back, to undo the damage and make the world the way it was when it had Jenny Flint in it. We know from historical Silurian stories that Silurians form strong clannish relationships, and certainly from The Hungry Earth/Cold Blood, we know they mourn their blood relations, feeling the loss of them keenly. Again, possibly Vastra’s idea that she’s the last of her kind is rooted in this clannish, deeply connected feeling. There’s no reason not to assume that as Jenny became more than a housemaid, opening up her mind and her skills-base from tea and cleaning to sword-wielding kickassery and advanced technology, Vastra grew to love the young human as much as or more than she would have any Silurian lover. Certainly, she loves her enough to be clear on their relationship – they are very distinctly married, not simply pair-bonded or involved. That shows a commitment on the part of the Silurian that proves the strength of her love for her human wife (we can only assume it was a Silurian ceremony, as it would be over a hundred years before gay people were legally allowed to marry in Britain - did I mention we’re almost clinically stupid about this kind of thing as a species?). 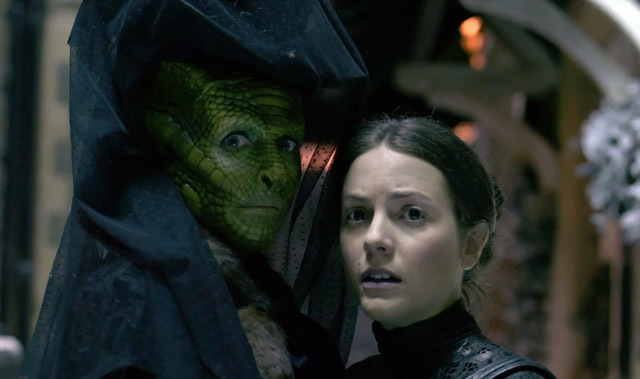 As a couple, Vastra and Jenny are clearly long-established (“with dresses and running and quite a lot of fun”) before the arrival of Strax, and perhaps the best sense of them is given in the idea of them both being alone, and alike, in a world that would regard them both as ungodly oddities were they to reveal their true natures in its society. Through rescue, safety, similarity and adventure, Vastra and Jenny have forged a love that keeps them alive and together, unbreakable in a world unready for the truth of them. Pioneers, adventurers and so much else, yes, absolutely. But more than any of that, simply united by a love that – at least within the walls of a house in Paternoster Row – conquers all the obstacles of Victorian convention.